Parksville/Qualicum Beach Tuesday bird walk, October 27. The Sunday Bird Walk went to the Nanaimo River Estuary in south Nanaimo. The morning was cloudy but the winds were calm. It did start to rain at the end of the morning. The highlights included seeing a Northern Shrike pursuing a Northern Flicker. There were at least two Northern Shrikes perched on a snag, giving us good views. We were fascinated as we observed Shrike chasing prey unsuccessfully three times. 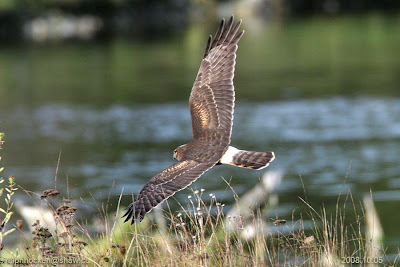 We watched a Juvenile Northern Harrier hunting as it flew low over the estuary. A Common Raven gave chase to the Harrier and the Harrier went right back after the Raven until the Raven flew away. The Northern Harrier perched for a long time giving us great views. We could see his mostly rufous coloured body with black wings and disc like face of a owl. There were at least ten Western Meadowlarks perched on trees and flying overhead all through the morning. Canada Goose, Trumpeter Swan, Great Blue Heron, Mallard, Northern Pintail, American Wigeon, Barrow's Goldeneye, Common Merganser, Bald Eagle,Sharp-shinned Hawk, Northern Harrier, Northern Shrike, California Gull, Thayer's Gull, Glaucous-winged Gull, Belted Kingfisher, Northern Flicker, Steller's Jay, Northwestern Crow, Common Raven, Western Meadowlark, Red-winged Blackbird, Eurasian Starling, American Robin, Spotted Towhee, Song Sparrow, Golden-crowned Sparrow, Ruby-crowned Kinglet, Bewick's Wren, Purple Finch, House Finch and Red Crossbills. Twenty-two Long-billed Dowitchers were seen at Holden Creek in south Nanaimo. A Varied Thrush was seen visiting feeders along Boundary Crescent in Nanaimo. One hundred and forty Pacific Loons were seen off shore off Yellowpoint Road in Cedar. Friday October 23:A Short-eared Owl was seen near the Point at Neck Point Park in Nanaimo. The Tuesday Bird Walk went to Columbia Beach. The morning was cloudy but the wind was calm and the water on the Strait of Georgia was like a mirror. including Bonaparte's, Mew, a Ring-billed, California, a Herring, Thayer's and Glaucous-winged Gulls, along with Black Turnstones and Black-bellied Plovers were on the gravel bar near the Pebble Beach Townhouses. Four small noisy flocks of Black Oystercatchers flew past us just above the water. Northern Flicker, Pileated Woodpecker, Common Raven, European Starling, Spotted Towhee, Song Sparrow, White-crowned Sparrow, Golden-crowned Sparrow, Dark-eyed Junco, House Finch and Red Crossbill. Two Anna's Hummingbirds are visiting feeders near Cathers Lake in Nanaimo. A Peregrine Falcon, an American Kestrel and a Bald Eagle were seen at the Shelly Road side of the Englishman River Estuary in Parksville. Male and female King Parrots and a family of Grey Butcherbirds have been visiting backyard feeders for the past week, along Edith Street North Haven in New South Wales, Australia. Guest speaker, Michele Deakin, local biologist, will give an update on eelgrass beds. Monday October 26, 2009 @ 7:30 pm. The Tuesday Bird Walk on October 27, 2009 will be going to Rathtrevor Provincial Park in Parksville. Meet at the Parksville Beach Community Park near the parking area at the Lion's Playground at 9:00 A.M. or the main parking area at Rathtrevor Provincial Park. Please note--there is a parking fee at the Park. 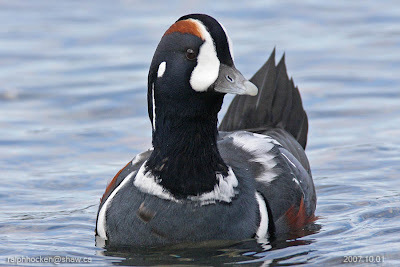 The Sunday Bird Walk on November 01 will be going to the Nanoose Estuary in Nanoose Bay. Meet at the Birdstore at 9:00 A.M. or behind the Church Camp off Arlington Road and highway 19, at about 9:15A.M. Please note--daylight savings time ends on November 01 and the clock falls back one hour. Among the highlights of the morning was a very large feeding ball of gulls and seabirds near the horizon. A raft of Greater Scaup, Surf Scoters and White-winged Scoters were seen not far from shore. Three flocks of Northern Pintail flew high overhead heading down the Strait. A large mixed flock of Gulls including Bonaparte's, Mew, a Ring-billed, California, a Herring, Thayer's and Glaucous-winged Gulls, along with Black Turnstones and Black-bellied Plovers were on the gravel bar near the Pebble Beach Townhouses. Four small noisey flocks of Black Oystercatchers flew past us just above the water. 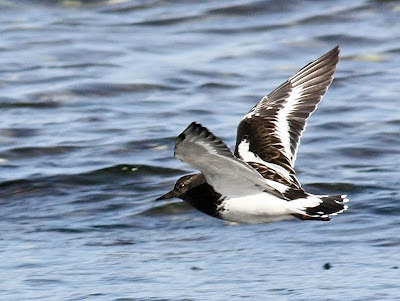 Black Turnstone: Jack Lasure Photo. The Sunday Bird Walk went to the Shelly Road side of the Englishman River Estuary in Parksville. The morning was cloudy but calm. The highlights included seeing a Sharp-shinned Hawk chasing a Northern Flicker and a Northern Shrike perched on a short bush near the estuary. Black Turnstones and Black-bellied Plovers flew past near the shoreline heading up the Strait of Georgia. We watched a Peregrine Falcon fly from one perch to another. He perched for a few seconds and then with powerful wind beats, he flew off towards the mainland. We soon lost sight of him over the Strait of Georgia. Canada Goose, Greater White-fronted Goose, American Wigeon, Mallard, Harlequin Duck, Bufflehead, Northern Pintail, Green-winged Teal, Surf Scoter, White-winged Scoter, Red-breasted Merganser, Common Merganser, Common Loon, Horned Grebe, Red-necked Grebe, Pelagic Cormorant, Great Blue Heron, Bald Eagle, Merlin, Peregrine Falcon, Sharp-shinned Hawk, Bonaparte's Gull, Mew Gull, California Gull, Thayer's Gull, Glaucous-winged Gull, Black-bellied Plover, Black Turnstone, Killdeer, California Quail, Belted Kingfisher, Yellow-rumped Warbler, Downy Woodpecker, Pileated Woodpecker, Northern Flicker, Northern Shrike, Northwestern Crow, Common Raven, Chestnut-backed Chickadee, Red-breasted Nuthatch, Brown Creeper, Golden-crowned Kinglet, Ruby-crowned Kinglet, Bushtit, Bewick's Wren, American Robin, European Starling, Spotted Towhee, Brewer's Blackbird, Fox Sparrow, Song Sparrow, Golden-crowned Sparrow, Savannah Sparrow, House Finch, Dark-eyed Junco, Red Crossbill and House Sparrow. The Tuesday Bird Walk went to the Shelly Road side of the Englishman River Estuary in Parksville. The morning was cloudy and the winds were calm however a shower finished off the morning. The highlights included seeing Varied Thrush just ahead of us on the trail and in the trees along the trail. We came across about one thousand American Robins in the forest and estuary throughout the morning. There was a Hermit Thrush in the brushes near the trail. 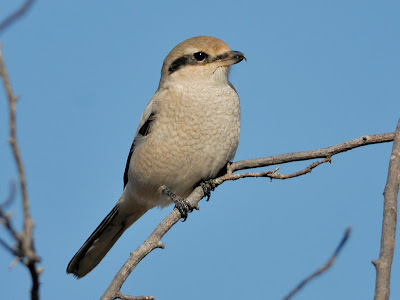 A Northern Shrike landed on a bush not thirty feet front us giving us incredible looks. 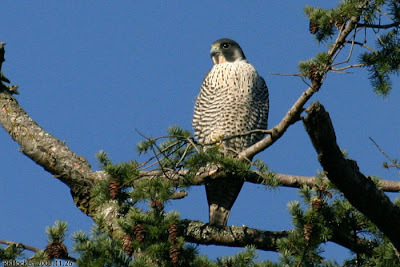 We saw a Peregrine Falcon preening itself in a tall fir tree on the west side of the forest. The Falcon left the perch twice and flew towards the Straight of Georgia only to return to the perch. When he returned for the second time he perched and looked down at us as if he was people watching. We saw a Merlin chasing a Northern Flicker. We spotted a Fox Sparrow gleaning insects from the leaves on a small bush. Canada Goose, American Wigeon, Mallard, Harlequin Duck, Surf Scoter, Common Merganser, Common Loon, Horned Grebe, Double-crested Cormorant, Pelagic Cormorant, Great Blue Heron, Bald Eagle, Merlin, Peregrine Falcon, Wilson's Snipe,Bonaparte's Gull, Mew Gull, California Gull, Glaucous-winged Gull, Belted Kingfisher, Hairy Woodpecker, Northern Flicker, Northern Shrike, Northwestern Crow, Common Raven, Chestnut-backed Chickadee, Red-breasted Nuthatch, Brown Creeper, Hermit Thrush, American Robin, Varied Thrush, European Starling, Cedar Waxwing, Spotted Towhee, Fox Sparrow, Song Sparrow, Golden-crowned Sparrow, Purple Finch, House Finch and Red Crossbill. One hundred and fourteen Pacific Loons were seen off Yellow Point in Cedar. The Tuesday Bird Walk on October 20, 2009 will be going to Columbia Beach. The Sunday Bird Walk on October 25 will be going to the Nanaimo River Estuary. Meet at the Birdstore at 9:00 A.M. or the end of Raines Road at about 9:30A.M. Juvenile Northern Shrike at the Nanaimo River Estuary: Bruce Whittington Photo. The morning was sunny but a strong cool wind from the east kept us moving to find shelter. The highlights of the morning included seeing two small flock of Pacific Loons. Their silver heads and necks caught and held our attention for the morning. A large number of Double-crested Cormorants, Pelagic Cormorants and a few Brant's Cormorants flew down the Strait of Georgia. An Eurasian Collared Dover flew past and over the tops of the tall trees heading east. We watched a flock of Red Crossbills singing and eating at the top of a tall fir tree. Canada Geese, Mallard, Surf Scoter, Common Loon, Pacific Loon, Double-crested Cormorant, Pelagic Cormorant, Brant's Cormorant, Bald Eagle, Mew Gull, California Gull, Glaucous-winged Gull, Thayer's Gull, Pigeon Guillemot, Common Murre, Northern Flicker, Eurasian Collared Dove, Bewick's Wren, Winter Wren, Bushtit, Chestnut-backed Chickadee, Red-breasted Nuthatch, Golden-crowned Kinglet, Ruby-crowned Kinglet, American Robin, Spotted Towhee, Song Sparrow, Dark-eyed Junco and Red Crossbills. A Northern Harrier, an immature Northern Shrike and two Western Meadowlarks were seen at the Nanaimo River Estuary in south Nanaimo. A White-throated Sparrow was seen at French Creek from the Columbia Beach side. Sixteen birders saw and heard the following thirty-eight species of birds. Canada Goose, American Wigeon, Mallard, Green-winged Teal, Harlequin Duck, Surf Scoter, White-winged Scoter, Long-tailed Duck, Common Merganser, Pacific Loon, Common Loon, Horned Grebe, Red-necked Grebe, Western Grebe, Double-crested Cormorant, Pelagic Cormorant, Great Blue Heron, Bald Eagle, Merlin, Killdeer, Black Oystercatcher, Black Turnstone, Bonaparte's Gull, Mew Gull, California Gull, Thayer's Gull, Glaucous-winged Gull, Common Murre, Belted Kingfisher, Northern Flicker, Northwestern Crow, American Robin, Yellow-rumped Warbler, Spotted Towhee, Song Sparrow, Golden-crowned Sparrow, Dark-eyed Junco and House Finch. Seven Pectoral Sandpipers and over one hundred Wood Ducks were seen at Buttertubs Marsh in Nanaimo. Over two hundred Pacific Loons were seen on Northwest Bay. A Northern Harrier being harassed by a Raven was seen over Wren Place in Nanaimo. Meet at the Parksville Beach Community Park near the parking area at the Lion's Playground at 9:00 A.M. or the end of Shelly Road at about 9:10 A.M. The Sunday Bird Walk on October 18 will be going to the Shelly Road side of the Englishman River Estuary in Parksville. Meet at the Birdstore at 9:00 A.M. or the end of Shelly Road at about 9:30A.M. White-throated Sparrow: John Purves Photo. 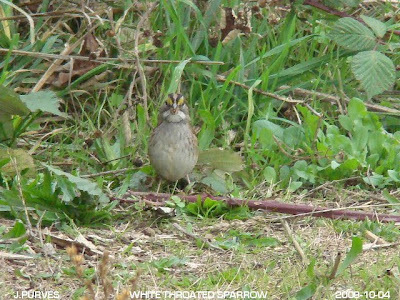 A White-throated Sparrow was seen yesterday October 08 at French Creek. The morning was sunny and warm--a perfect day for birding. 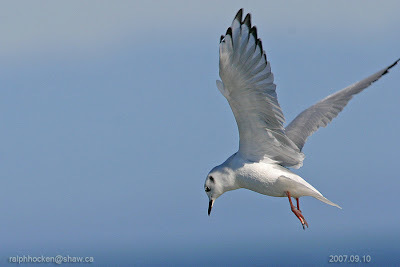 The highlights included the sighting of a Common Murre, five species of Gulls--Bonaparte's Gulls, Mew Gulls, California Gulls, Thayer's Gulls and Glaucous-winged Gulls. Harlequin Ducks entertained us not far from shore. A raft of Pacific Loons, a Western Grebe, Horned Grebes and Red-necked Grebes were spotted offshore. 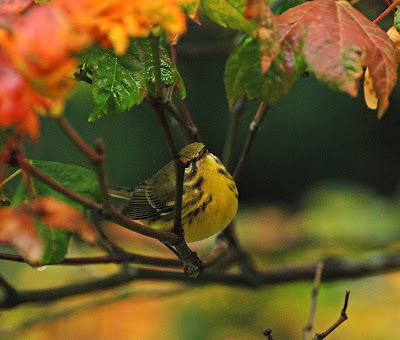 Prairie Warbler: Guy Monty Photo. The morning was sunny and very comfortable. The big surprise of the morning was the sighting of four Pectoral Sandpipers and a Wilson's Snipe on top of the vegetation in the marsh near the Millstone river. A Red-tailed Hawk circled over us looking for thermos. We saw several Yellow-rumped Warblers throughout the morning. Canada Goose, Mallard, American Wigeon, Green-winged Teal, Wood Duck, American Coot, Pied-billed Grebe, Pectoral Sandpiper, Wilson's Snipe, Bald Eagle, Cooper's Hawk, Merlin, Red-tailed Hawk, Northern Flicker, Rock Pigeon, Band-tailed Pigeon, Great Blue Heron, Belted Kingfisher, Common Raven, Steller's Jay, Red-winged Blackbird, Cedar Waxwing, American Robin, Yellow-rumped Warbler, Chestnut-backed Chickadee, Bushtit, Marsh Wren, Bewick's Wren, European Starling, Spotted Towhee, Song Sparrow, Golden-crowned Sparrow, American Goldfinch, Red Crossbill, Purple Finch, House Finch and House Sparrows. "Rare bird alert"--Prairie Warbler" A Prairie Warbler has been seen in a backyard in Tofino since September 28 and was seen again today. The Prairie Warbler is usually found in the eastern and southeastern United States and winters in the West Indies. A Western Grebe was spotted off shore from Shorewood Drive in Parksville. A Yellow-rumped Warbler was seen near Dolphin Lake off Rockhamption Road in Nanoose Bay. A raft of Surf Scoters and a Common Loon were seen on the Strait of Georgia off Madrona Point. Mew Gulls and two Pacific Loons were seen on the Strait of Georgia off Brickyard Community Park in Nanoose Bay. 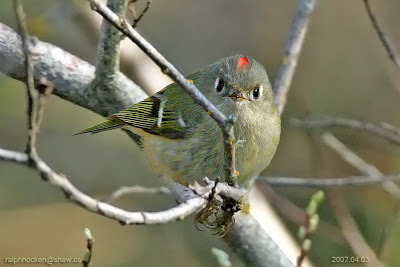 An Orange-crowned Warbler was seen at Neck Point in Nanaimo. Dark-eyed Juncos have been seen at Columbia Beach and in a backyard along Meridian Way in Parksville. Two Long-billed Dowitchers were seen at Buttertubs Marsh in Nanaimo. The Tuesday Bird Walk went to the Little Qualicum River Estuary in Qualicum Beach. The morning was cloudy with rain causing the bird walk to be cut short. However, we did managed to find twenty-three species of birds during the short time that we were out. We saw Surf Scoters, White-winged Scoters, Black Scoters, Common Loons, Horned Grebes, Red-necked Grebes, Black Oystercatchers, a Song Sparrow and Savannah Sparrows at the viewing tower off Highway 19A. At the Estuary we saw a large numbers of Gulls and American Wigeon before the rain began pelting down. Nineteen birders saw and heard the following twenty-three species. Twenty-five Sandhill Cranes were seen and heard flying over Woodgrove Mall in Nanaimo. Three Lincoln's Sparrows, European Starlings and a Pileated Woodpecker were seen in a garden in the San Pareil area of Parksville. A white Common Raven was spotted along Highway 19 between Qualicum Beach and the Horne Lake turnoff. affected this area over the ages. The Tuesday Bird Walk on October 06, 2009 will be going to the Little Qualicum River Estuary in Qualicum Beach. Meet at the Parksville Beach Community Park near the parking area at the Lion's Playground at 9:00 A.M. or the viewing tower at highway 19a and Garrett Road in Qualicum Beach at about 9:20 A.M. The Sunday Bird Walk on October 11 will be going to the Neck Point Park in Nanaimo. Meet at the Birdstore at 9:00 A.M. or at the parking area at Neck Point Park at about 9:20 A.M.